Selfridge is a joint military community located 22 miles east of Warren, Michigan, on Lake St. Clair. As the last base in Michigan, Selfridge supports a population of 50,000 people. It is the only base in the U.S. where all five services work together. Spalding DeDecker (SD) worked at the Selfridge Air National Guard Base on a variety of different projects for several different clients. Projects involved portions of the site adjacent to or on active runways, taxiways, and tarmacs and required close coordination with all involved in order to meet safety standards necessary due to aircraft operating in the area. • Runway for Dan’s Excavating Inc.
• Taxiway Lights for Rauhorn Electric. Inc.
• East Ramp Pavement Repair for John Carlo, Inc.
• Pre-manufactured Building for Wiss, Janney, Elstner Associates, Inc.
For the East Ramp Pavement Repair project, large sections of deteriorated pavement needed to be repaired. Minimal design information was provided on the plans and specifications for the project. SD obtained existing elevations of the paved area, which had been patched with asphalt pavement and was in poor condition. SD established the limits of pavement removal. Based upon the existing conditions, proposed grades were calculated that would return the pavement to a consistent surface that approximated the previously existing conditions. Grades along the proposed paving lanes were calculated and cut-sheets were produced for the layout. Grades were extrapolated to the offset location to account for varying pitch of the paving machine. 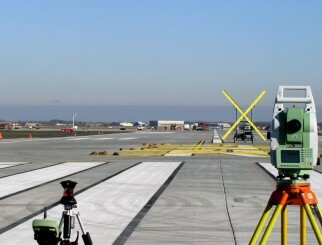 SD provided surveying services on other projects and included performing as-built measurements for a newly constructed runway, performing layout for a pre-manufactured building, and providing layout for runway lights. The layout of runway lights required setting reference lines for orienting the lights in a precise direction, so that the lights were visible to the pilots as they traversed along the runway. Working on a base required coordination with both clients and base officials in order to obtain passes and clearances for site access. The additional security was necessary due to the nature of the facility.